Newly approved deputy ministers, among them four full cabinet ministers, have today subscribed to the oath of office in line with Section 57, Act No 6 of the 1991 Constitution, permitting them to take up their respective offices. His Excellency President Julius Maada Bio, Honourable Vice President Dr. Mohamed Juldeh Jalloh, Chief Minister Professor David J. Francis and other officials of government graced the event, which took place at the Credential Hall, State House. 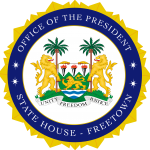 The President congratulated them on their appointments, adding that choosing them from among many Sierra Leoneans was a difficult decision. He, however, disclosed that he was very confident that they would deliver. “My government has made a promised to the people to improve their lives and I expect you as agents of change to deliver on that. We have a social contract with the people of this country and I have said that we cannot afford to fail. We must deliver. I cannot do it alone that is why I have called on you as fellow compatriots to join me in delivering all that I have promised this nation. It is your responsibility to make sure that all that I have said is done for the benefit of Sierra Leone,” he said. While acknowledging the difficult task ahead, President Bio stated that: “The task is a tall order. Quite tough but I believe you are tougher, if not I would not have appointed you. That is a challenge to all of you and we have to rise up to the occasion. We have suffered a lot as a country but with the determination, zeal and political will from my part, we must collectively make this nation a better place,” he reassured. Foreign Affairs Minister, Dr. Alie Kabba, who spoke on behalf of the ministers, expressed his profound joy and gratitude for the opportunity to serve the nation under President Bio, whom he described as a man who has always put his life and everything for the betterment of Sierra Leone. He said that they would remain committed to serving the nation with loyalty and dedication. “My colleagues and I will continue to be steadfast and our commitment to serve this nation will remain unrivaled. We look unto our President to provide us with the structures and we will be ready to build upon them in transforming this nation. We will continue to make the people of Sierra Leone realize that the new direction is indeed the right direction for our country,” he said.